Wikileaks will be temporarily suspending its publication of confidential documents in order to fight a financial boycott against the organization that has reportedly cut off 95 percent of its revenue. "WikiLeaks has published the biggest leaks in journalistic history," WikiLeaks Co-Founder Julian Assange said at a press conference Monday. "This has triggered aggressive retaliation from powerful groups." The "powerful groups" Assange is talking about consist of banks, credit card companies, and money transfer companies: the Bank of America, Visa, MasterCard, PayPal, and Western Union. According to Assange, this "arbitrary and unlawful financial blockade" has destroyed about 95 percent of WikiLeak's revenue. 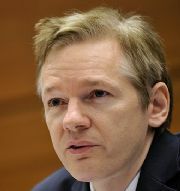 "It came as part of a concerted, U.S.-based political attack that included vitriol by senior right-wing politicians in the United States and high-level calls for the assassination of WikiLeaks staff and myself personally," Assange said. He says the blockade has forced WikiLeaks to run on cash reserves for the past 11 months, and has cost the organization tens of millions of dollars in lost donations. He says that WikiLeaks must now divert its "scarce resources" to focus entirely on "fighting this unlawful financial blockage." According to Assange, WikiLeaks has initiated legal action against the blockade in Iceland, Denmark, Brussels, the United Kingdom, the United States, and Australia. It has also filed an anti-trust complaint to the European Commission, and expects to hear a decision on that action by next month. The financial blockade on WikiLeaks occurred shortly after the organization began releasing confidential U.S. diplomatic documents in November of last year. Assange argues that the current conflict between WikiLeaks and some of the most powerful financial institutions in the world has far-reaching consequences. "If this financial attack stands unchallenged, a dangerous, oppressive and undemocratic precedent will have been set, the implications of which go far beyond WikiLeaks and its work," he warned. "Any organization that falls foul of these powerful financial companies or their political allies can expect similar extrajudicial action."